If you’ve been lucky enough to have a girlfriend who helped you get dressed for an important date, you know how useful it can be to have someone else’s input. Or perhaps your brother has saved you from heading out with what could have been a disastrous pair of shoes. Maybe you depend on your wife to give you a yay or nay on your tie selection. Most of us value a second opinion when it comes to wardrobe, hair, and other aesthetic choices. Somehow, however, when it comes to mental preparation, we too often leave that to chance, cross our fingers, and fly by the seat of our pants. Our careers are a composite of meetings, presentations, introductions, interviews, pitches, negotiations, and various humans interactions (although some are pretty beastly). Many are formalities, but some are absolutely critical to our success, our professional growth, and our happiness. Those events should be carefully prepared for, including review and practice sessions with professional guidance. The lack of practice in the workplace is striking—even shocking—when we consider the difficulty of routine job requirements, particularly those of managers. Giving a performance review, terminating an employee, presenting in front of a hostile audience, running a big meeting—those everyday tasks require significant skill, and yet, they are almost never practiced. A presentation might get a quick dry run, but that still misses the benefits of thoughtful, iterative practice, including feedback. Each session with my clients culminates with the development of some exercises they will work on until the next session. Usually those exercises are the practice of a specific, new behavior, such as speaking authoritatively with a staff member, using power poses, attending a networking event, or confronting a troublemaker. The philosophy behind these exercises is that we cannot get better unless we practice, and the more we practice, the easier it will become to undertake those difficult activities. In his book Practice Perfect, teacher Doug Lemov describes the “get it / do it gap,” the difference between being shown or told what to do and actually doing it. My efforts with my clients will be limited if we only talk about change and never practice it. Ironically, we often steer clear of the activities we don’t do well. Poor public speakers avoid the podium at all costs, managers who write badly prefer not to send emails, and people who are nervous about networking won’t go out. We stumble through a presentation and pray for it to be over. We mishandle a performance review and sigh with relief that we won’t have to do that again for another year. It’s no surprise that we don’t get better at what we do badly. Good practice isn’t merely repetition. Playing a piece of music on the piano over and over and making the same mistake every time is mindless. The weak points of your performance have to be isolated, analyzed, and overcome. Getting feedback and advice from someone else can be very helpful and will allow you to get better faster. The goal of good practice is mastery. You want these new behaviors to be so natural that you don’t have to think about them anymore and they look effortless. Write down what behavior you are working on. Select activities that are related to the section of You, Not I that you are reading. Practice in front of a mirror to the extent that it is feasible. That will allow you to do real time adjustments and efficient corrections. Take your time—good practice is time consuming, but it should be rewarding. If it’s working, you should be getting better. Identify the tough spots and practice those in isolation. 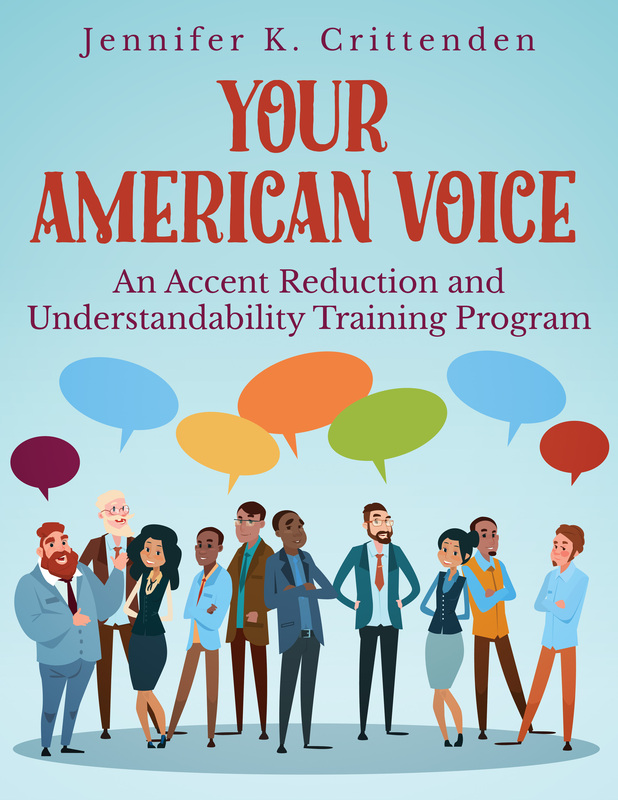 It may take multiple tries before you find the perfect phrasing and tone of voice for a difficult message. Focus on small incremental improvements. You are unlikely to turn in an earth-shaking performance on your first few tries. Keeping your expectations low, but correctly identifying when real progress has been made will keep you motivated. Practice with someone else. A partner can provide companionship, motivation, support, and constructive advice. Ask for feedback. And practice again to prove that you have mastered whatever shortcomings were identified in the feedback. *Excerpted from You, Not I: Exceptional Presence through the Eyes of Others by Jennifer K. Crittenden, Whistling Rabbit Press, 2014. NEW TRAINING PROGRAM: Creating Exceptional Presence. Learn to master perceptions through behavior modification techniques used by actors and athletes. Limited first enrollments accepted in February 2014. 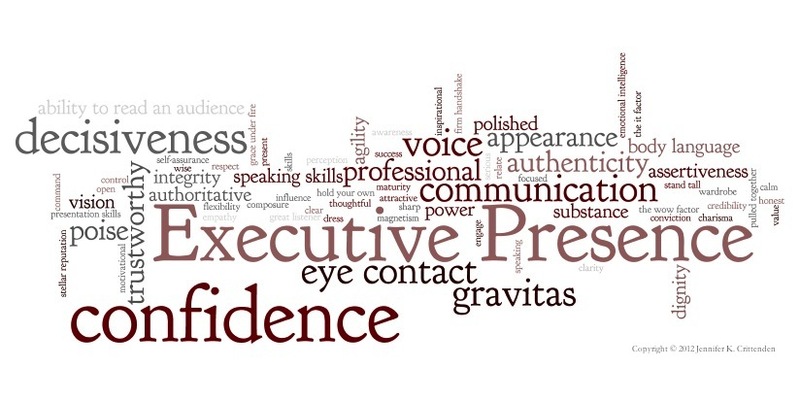 Skills taught and practiced: Self-analysis, Sensitivity, Interpersonal, Verbal, Style, Situational, and Performance. 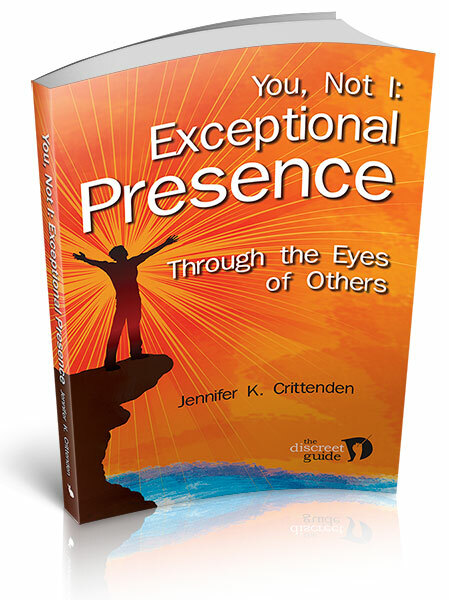 Based on my new book: You, Not I: Exceptional Presence through the Eyes of Others. Additional materials include the Creating Exceptional Presence Handbook. All materials are included at no extra charge, including a certificate of completion. Can be taught in-person or online. It is comprised of nine 90-minute sessions, combined with readings, developmental exercises, and video-analysis, with an emphasis on tactical information and tangible results. This program is a modification and extension of the Executive Presence Program which was launched in 2013 through the University of Wisconsin and the National Association of Women MBAs.Contact me at jennifer(at)discreetguide(dot)com for enrollment information.